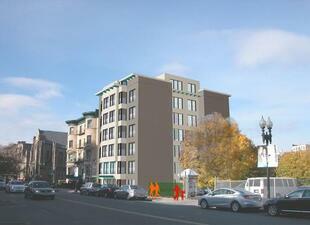 Banker & Tradesman - Multifamily Development Marches Down Brighton Ave. Multifamily Development Marches Down Brighton Ave.
Boston-based Hamilton Co.’s continuing plans for redeveloping Allston parcels into multifamily projects would add 114 apartments a block from busy Packard’s Corner. The Auto Zone store at 45-55 Brighton Ave. would be demolished to make way for a 6-story, 100,000-square-foot building containing 65 apartments and 20,000 square feet of ground-floor retail. And 79-83 Gardner St. would be redeveloped with a 38-unit apartment building incorporating an existing Victorian home as the entrance. Covered parking would be provided for a combined 215 vehicles. Groundbreaking of the $85 million project designed by Hacin & Assoc. on a 2-acre parcel is expected next spring, pending approval by the Boston Redevelopment Authority. Hamilton Co. has assembled a portfolio of 763 housing units in 24 buildings in the neighborhood over the past six decades, comprising about one-fifth of its residential holdings in Boston. The project “will interconnect and knit these parcels together through rich, new landscaped pathways, courtyards and terraces to create a desirable home-base and destination for middle-class Bostonians,” Hamilton Co. President Carl Valeri said in a statement. Rents are expected to be roughly 40 percent below new luxury apartments in the downtown area. Hamilton Co. is currently building a 48-unit apartment complex on a former parking lot at nearby 40 Malvern St. with units averaging 900 square feet and rents starting at $2,600 per month.